Once upon a time....the ranch started as a dream of two newlywed city slickers who desired nothing more than a slower, more peaceful, and tranquil life surrounded by beautiful land and numerous farm animals. Growing up we watched the TV show Little House on the Prairie and listened to countless country songs that talked about the good ol' days, but neither of us had first hand experiencing of this lifestyle and what to us only seemed like something out of country western fairy tale. However, we were determined in pursing our dream. In 2015, we located and closed on a 40 acre piece of land that had become over grown after siting fallow for numerous years. We saw, in the land, the beauty of what it truly was and immediately fell in love with the land and the strong values of the community that surrounded it in Iola, Texas. 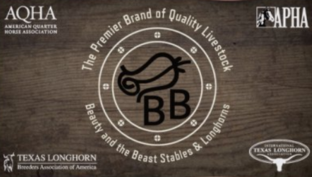 On May 21, 2015, Beauty and the Beast Stables & Longhorns was founded. It has been a lot of work for two 1st generation ranchers but while we transform the land, the land is also transforming us. While the Beauty of our land daily refreshes our heart, the beasts that roam it bring all of our fairy tale like dreams into reality as we see daily progress towards our happily ever after. Matt is a special education administrator during the time he is not serving as "the Director of Land Management" on the ranch. Matt can usually be found juggling multiple building projects or breaking the tractor which then inevitably leads to him repairing the tractor. He has spent a great deal of time clearing the land and building fences, a task that will continue to keep him busy for at least another decade. Matt's love of Star Wars has served as the inspiration for many of the names of the cattle born here on the ranch. In his spare time, Matt also enjoys designing our publication materials, graphics, and signs. However, his favorite past time is standing out in the pasture watching the cows graze with the setting sunset engulfing the sky above. Sara AKA the Director of Animal Management, ensure that all of the animals we breed are of the highest pedigree, are kept in top health, and continuously loved on by human hands. Sara spends countless hours with all of the animals here on the ranch and the love that she shows them is payed back to her time and time again. The animals, big and small, can be seen following her around or running along side her as she passes by on the Gator. Sara is in charge of all of our animal acquisition and has a keen eye for ensuring and identifying livestock with great potential and a loving temperament. When not on the ranch, Sara is also caring for human youngsters as she serves in the role of an associate principal. Claire is the Coordinator of Financial Assets and Animal Hospitality. She spends a great deal of time ensuring that the directors do not spend too much money and reminding them that she is the boss. Claire also brings joy to the livestock with her uplifting spirit. She can often be found in the back of the Gator smiling, laughing at the longhorn moo moos, and reaching out to touch furry things. Her favorite animals, of course, are the longhorns which she expects to spend a great deal of time with every day. When not coordinating animal hospitality, Claire spends a great deal of time napping and drinking protein shakes, which from time to time can be seen being chucked out of the side of the Gator. We have worked hard to research and hand pick every animal that calls Beauty and the Beast Stables home. In doing so, we truly believe that we have built a premier brand of livestock that will exceed the expectations of our customers. It is our personal guarantee. Isaac Newton once said, "If I have seen farther, it is by standing on the shoulder of giants." In the longhorn industry we are proud to continue the great legacy passed down to us by the great ranchers of the past such as the Butlers, Marks, Peelers, Phillips, Wrights, Wichita Refuge, and Yates. This is a genetic legacy to which every single one of our cattle trace back their heritage. Additionally, the outstanding quality of our pedigree is due in great part to the phenomenal breeding programs of the modern legends in Longhorn ranching who are listed below and to which at one time our longhorns called home.